Jed is a regular kid with a normal, loving family . . . that is, if it's normal for a loving family to drop their child off in the middle of nowhere and expect him home in time for Sunday dinner. Luckily, Jed excels at being a regular kid who-armed with wit and determination-can make his way out of any situation. At least until the morning of his twelfth birthday, when Jed wakes to discover his parents missing. Something is wrong. Really wrong. 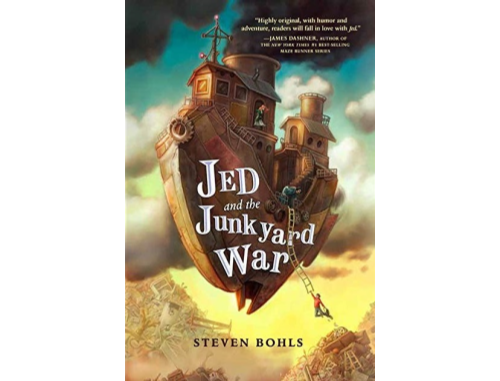 Jed just doesn't realize it's floating-city, violent-junk-storm, battling-metals, Frankensteined-scavengers kind of wrong. Yet. Resilient Jed, ready to escape this upside-down place, bargains his way onto a flying tugboat with a crew of misfit junkers. They set course to find Jed's family, but a soul-crushing revelation sends Jed spiraling out of control . . . perhaps for good.